Rapid Mixer Granulator is used for wet mixing for granulation that has been enhanced application in the Pharma industries. Wet granulation is a widely used process in the pharmaceutical industry as an important part in improving the flow properties, homogeneousness and compressibility of the solid dosage powder mix. By adding of suitable binder wet massing is accomplished by high mechanical agitation by an impeller and chopper. Mixing, densification, and accumulation of wetted materials are achieved through shearing and compaction forces applied by the impeller. The impeller rotates on the horizontal shaft at a rotational speed corresponding to a radial blade tip speed and primary function of chopper is to breaks lumps into smaller fragments to achieve a more homogeneous. Basic machine is in Non-Flame Proof Construction. Main structure is made up of heavy duty MS Square tube, with bottom portion of legs made from SS 304. RMG with Platform and Staircase made of SS-304. Simply it is structure based design and discharge height will be design based on FBD container height. All the contact parts are made up of SS 316 and Mirror Finish & non-contact parts are made up of SS 304 with Matt finish. All gaskets products are made up of Silicon or Food Grade Material. The complete machine is supported with Anti Vibration Pad to avoid the vibration of the machine. Basic design of RMG is in Vacuum rated design and hence you can connect with the Vacuum Transfer System (Pneumatic Conveying System) for material loading in to the RMG. We can also connect the Vacuum Rated Sifter (“SigmaSift”) with RMG and with conveying system as a RMG loading with inline sifting process to avoid manual intermission. Top lid is pneumatically operated with interlock and failsafe design. Discharge is pneumatically operated with interlock and failsafe design. Four Blade Impeller, which provide better dry mixing and better quality of Granules. 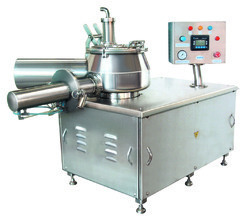 Basic machine is with air pressure switch & interlock with purging system. Looking for SOLID DOSAGE EQUIPMENT ?